The first thing people ask me about climbing in Kyrgyzstan is Where is it? Suffice to say, it’s where Kazakhstan, Tajikistan and China meet. The mountains of the Tien Shan range are some of the least explored in the world. These were to be my next peaks of perfection. Access was gained by an ex-military six-wheel drive truck, climbing up dozens of hairpin bends into the high mountains. We left the road and crossed open steppe, bogs and rocks before the real fun began. We arrived beside some tranquil mountain melt water, surrounded by grassy knolls, colourful flowers and dominated by 4000m+ peaks. Only a few had ever been climbed. After one night in camp the first assault began, with a 4200m summit being the first target. The next was a peak of 4500m that could be climbed from base camp in a day. Unfortunately, my frostbite injuries stop me from tackling the most technical routes, so I decided to climb the peak across huge glaciers and snow ridges in a more alpine style. The sun was baking, but the six-hour climb was well worth it. Descending home was hard work, as my feet hate going downhill. Doing it without toes is one of the hardest lessons I’ve had to learn. I was very tempted to ‘bumslide’ down one ice field, but the deep crevasses at the bottom put me off. I was also more than a little worried about the ‘deep crevasses’ that might start appearing in my own bottom! Camp was established high in a valley where I doubt anyone had ever been. Flowers and grass changed into scree and above the tents was an amphitheatre of glaciers and peaks. Over the next two days I managed a new route, crossing hideously loose and exposed rocks and two unclimbed snow peaks. 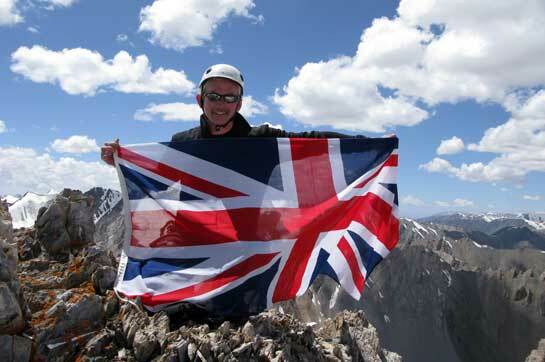 As with every mountain I climb, I unfurled my Union Flag for the summit photo. This is only my second flag in twenty years. The original is somewhere on Mt McKinley. To see the full expedition report please click here.